TMC's CleanTop Optical Top, available in a non-magnetic construction, is recommended for applications requiring the support of a high-strength magnet or the maintenance of a homogenous magnetic field. Though no alloy of stainless steel can be 100% non-magnetic, the 316 alloy top and bottom layers offer a dramatic reduction in ferromagnetic properties. At the same time the sidewalls and cups are completely non-ferrous. Steel to steel to steel. CleanTop achieves a spill-proof core with only two bonding layers: top skin to core and core to bottom skin. Imitations must add a third bonding layer which weakens the structure: top skin to plastic layer, plastic layer to core, and core to bottom skin. Thermal stability. The CleanTop all steel construction assures materials of identical coefficient of thermal expansion ensuring optimal thermal stability. TMC's CleanTop Optical Top is the best method yet for providing a spill-proof, clean, precise, and corrosion resistant optical top with unmatched structural performance. CleanTop is a standard feature of all TMC optical tops. Individual CleanTop cups are epoxy-bonded under each tapped hole after it is tapped and cleaned. Cups are made from chemically resistant nylon. Holes are tapped and countersunk prior to adding the cups to allow the machined top sheet to be thoroughly cleaned with open, rather than blind, holes prior to bonding. The top plate is processed through a custom TMC industrial cleaning center where a high pressure, high temperature cleaning solution is forced through each threaded hole, completely clearing any machining or tapping debris. Several rinse and dry cycles ensure an essentially "sterilized" top surface prior to bonding the cups. Liquid spills on the surface are contained and cannot reach the top's honeycomb core. The core is completely clean and dry with no residual thread-cutting oils to out-gas. Extremely clean tapped holes make screw insertion smooth and simple. Easy retrieval of small parts dropped into the holes is assured. Since no penetration of the core is possible when dangerous chemicals are used on the top's surface, health hazards will not occur by chemicals reaching the core unnoticed. 1. Sidewalls of TMC tops are 0.075 in. (2 mm) thick, damped, cold-rolled formed steel (see center photo, above), unlike the moisture-absorbing particle board favored by other manufacturers, presumably for its low cost. In addition, steel provides structural integrity unattainable with particle board sidewalls. 2.TMC’s design does not require enlarging core cell size because CleanTop cups are cylindrical, not conical like molded plastic membrane cavities. Our average cell size of 0.5 in.2 (3 cm2) is at least 50% smaller than molded cavity top designs, assuring the highest stiffness and greatest core-to-skin bonding contact area. 3. CleanTop achieves a spillproof core with only two bonding layers: top skin to core and core to bottom skin. Imitations must add a third bonding layer, which severely weakens the structure: top skin to plastic layer, plastic layer to core, and core to bottom skin. 4. Additionally, to avoid excessive epoxy being squeezed into the plastic cups, imitative designs use only the thinnest layer of epoxy between the top skin and plastic layer. The thinness of this layer can produce “voids” when the top is bonded by trapping air, significantly weakening the bond. 5. TMC employs a proprietary process to clean our machined skins to a level that is virtually “sterilized.” This ensures the cleanest threaded holes and superb epoxy bonding. Furthermore, the cleaning station is in an entranceway to a clean, finishing building so that the cleaned top never sees a heavy, industrial machining environment. In the CleanTop® design, no machining, grinding or sanding of any kind is performed subsequent to this cleaning process. 6. TMC top skins are stretcher-leveled, stress-relieved, and pressure-bonded against a precision-lapped granite plate, without subsequent grinding—avoiding heat and stress. The finished top is flat within ±0.005 in. (0.13 mm) within the entire tapped hole pattern, regardless of top size, guaranteed. TMC top skin (above) and competitive design top skin (below) after grinding. 7. Top surfaces of TMC tops are lightly sanded with an orbital pattern to remove burrs and provide a non-glare, non-reflecting finish, without inducing internal stress. TMC no-glare surface (above). Ground surface of competitive design creates reflection and glare (below). 8. Standard mounting holes in TMC tops are tapped, either 1/4–20 on 1 in. centers or M6 on 25 mm centers. Imperial 1/4-20 tapped holes on 1 in. staggered centers and metric M6 on 25mm staggered centers are available at a nominal additional fee. Custom patterns, including large through-holes for cables, etc., are easily accomplished with our multiple 2,000-watt laser machining centers. 9. All TMC mounting holes are in register with open cells in the honeycomb core (a given with CleanTop® but not necessarily with other designs). This assures that the core is not damaged by subsequent drilling and tapping during manufacture, that the structural integrity of the assembly is maintained, and that all mounting screws can be inserted to full depth without obstruction. TMC registered holes (shown without CleanTop® cups.) (top), Competitive non-registered holes (bottom). 10. Every hole in a TMC top is lead-screw-tapped, the most precise method known, and there are no inserts. Inserts can loosen, and top skins can be distorted when inserts are pressed into undersized holes. 11. TMC mounting holes are slightly countersunk to remove ridges and burrs. Every TMC mounting screw can be finger-tightened at first insertion – no wrench is needed. 12. TMC’s broadband dry damping approach is the only logical one for an optical top. Others use "tuned" dampers which only work on a discrete frequency. Structural resonances are not discrete and therefore not eliminated but rather "split" into two resonances by tuned dampers. 13. TMC’s honeycomb core is made of 0.010 in. (0.25 mm) thick steel, work-hardened and plated to prevent corrosion and assure years of service. Steel honeycomb is the ideal material for optical tops since the Young’s modulus of steel is three times that of aluminum. 14. TMC’s honeycomb core is a closed-cell structure with basic cell size of 0.5 in.2 (3 cm2), giving a core density of 13-14 lbs/ft3 (300 kg/m3), significantly greater than others on the market. The effective core density is 18-20 (16 lbs./ft3) including sidewalls and dampers. 18. Structural damping of TMC tops is accomplished using broadband mass dampers which are separate from the core, do not permit hysteresis or creep of the top, and do not detract from the top’s stiffness. 19.Our unique, direct core-to-top bonding improves the thermal conductivity of the core to the outside environment, reducing the "thermal relaxation time" for the top. 20. Our skins, core, sidewalls and dampers are all made of steel and therefore have the same coefficient of thermal expansion. Thus, even in situations with repeated temperature cycling, a TMC top expands and contracts as a whole, assuring structural integrity and preventing long-term internal stress buildup. Structural Damping – TMC has long adhered to the philosophy that dry damping of an optical top is preferable to oil-based dampers. Oil's characteristics can change over time and hidden oil reservoirs are always in danger of being pierced by an end-user customizing his system. Our approach to damping of structural resonances has consistently been based on a "broadband damping" approach. "Tuned damping," or using a tuned mass-damper to resonate out-of-phase with a top's bending mode, is a risky approach. First, it assumes the damper can be set to exactly coincide with the resonant frequency of the top. An optical top's resonant frequency will vary based on load, distribution of load, temperature, and even the presence of the dampers themselves. Therefore, in practice, it is difficult to tune the dampers to the top's resonance. Furthermore, it assumes that only the lowest resonant frequency requires damping when many secondary bending and twisting modes require attention. More importantly, the notion of incorporating a tuned mass-damper to suppress a structural resonance is a flawed one. Tuned damping is only effective in damping discrete resonances and is misapplied when used to damp a broadband structural resonance. In simple terms, a tuned damper "splits" a structural resonance into two resonances by creating a coupled mass system. TMC's proprietary broadband damping techniques are the most effective way to damp an optical top. This approach works over the entire frequency range of interest, dissipating energy at the top's primary, secondary, and higher resonant frequencies. In addition, performance will not be compromised by adding weight to the top. TMC's CleanTops are engineered using the most advanced methods for structural analysis and design. The Operational Deflection Shape shown above was measured using a technique called Laser Scanning Vibrometry (LSV). LSV is among the most sensitive and most accurate non-contact vibration measurement techniques commercially available. It uses the laser doppler effect to measure the behavior of the entire table rather than the behavior one discrete point. Structural Damping Performance Summary – TMC optical tops have guaranteed performance levels which are unsurpassed. In addition, with three levels of broadband damping and three environmental choices, TMC offers the most flexibility in choosing a performance level. Guaranteed maximum compliance levels for the maximum damping level are tabulated in the plots below. The standard damping level offers compliance levels a factor of four times higher than those tabulated. The minimum damping level is only recommended for non-sensitive applications. The curves summarize the guaranteed performance levels of TMC optical tops. In addition, table top corner compliance data are presented for the three damping levels available. Data were acquired by impact testing, using a one-pound calibrated hammer, accelerometer, and dual-channel spectrum analyzer. As these examples demonstrate, actual measured performance is often considerably better than our guaranteed performance. 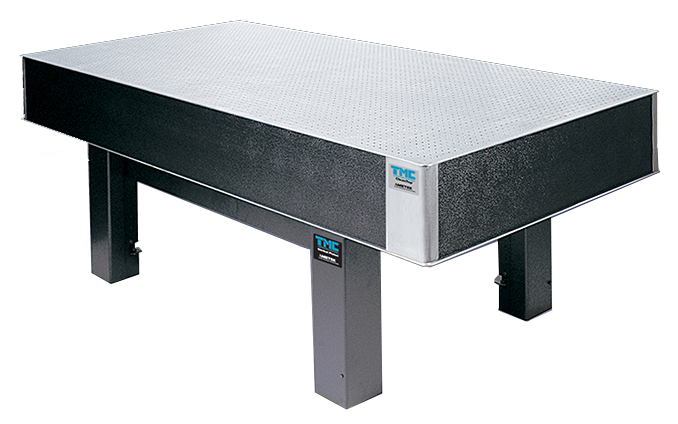 TMC offers a wide variety of leg systems for CleanTop optical tables. Traditionally our optical tables are a great match with our Micro-g pneumatic vibration isolation systems, which provide the best balance between cost and performance. For less vibration-sensitive applications we have rigid non-isolating legs, while ultra-sensitive equipment will benefit from our STACIS piezoelectric vibration cancellation technology solutions, such as LaserTable-Base. Browse all optical table support systems here. You can now request a quote for CleanTop optical tables via our Online Product Configurator.